Cooking a multi-course meal in a 2′ x 4′ kitchen can be a bit daunting, but this year our meal was a success. With only two of us and a tiny oven, I wanted to make just the right serving sizes to have for our dinner and few leftovers. My first plan was for the turkey. 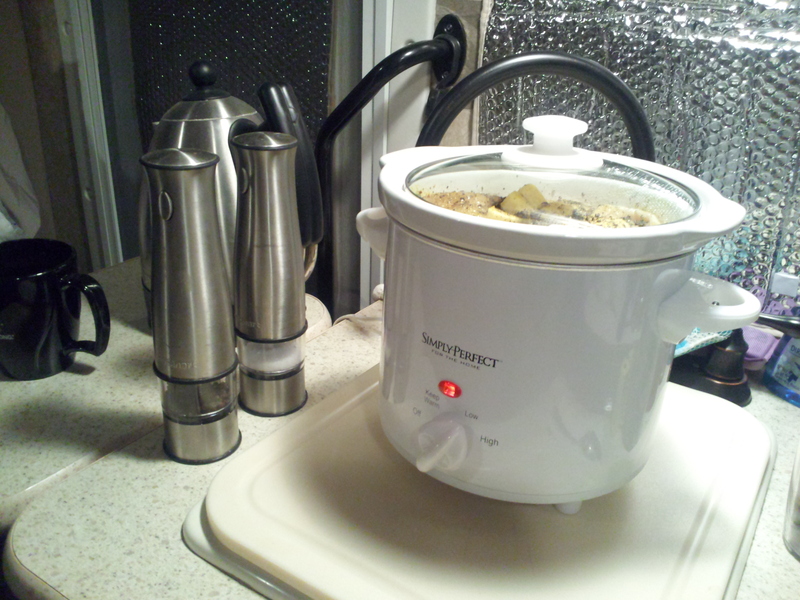 I decided on crockpot cooking and a 3# Butterball turkey breast. The breast comes in a plastic bag with the turkey wrapped in a string net along with a bag of gravy starter. I started by taking the turkey out of the string net. There were two large pieces and a few small chunks. After cleaning the pieces, I set them aside and cut a red onion into 8 chunks and readied two garlic gloves. 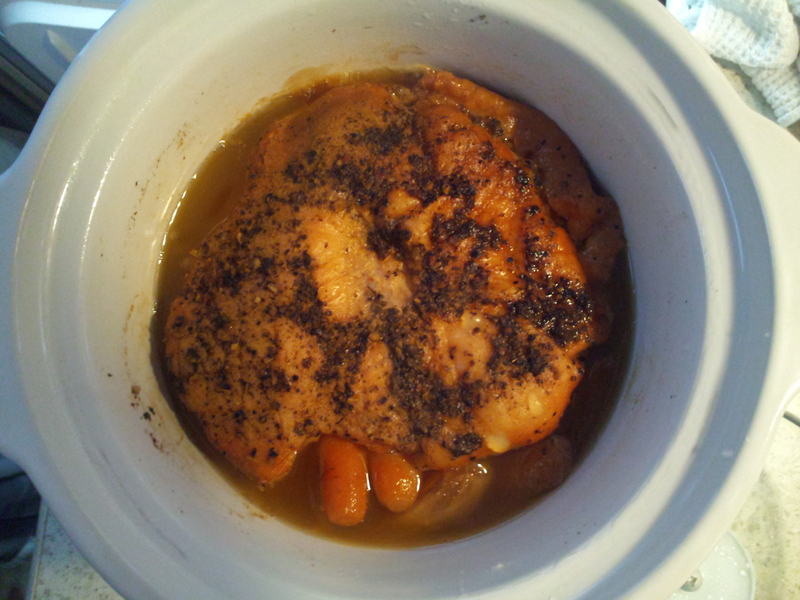 I layered the ingredients in the crock pot as such: 1/3 stick butter, 1/2 of the onion chunks, 1 diced garlic clove, 1/2 the turkey, spices, 1/3 stick butter, 1/2 bag baby carrots, the second 1/2 of the onion, second clove of garlic, all topped with the second 1/2 of turkey, skin side up. At the very top I added the last 1/3 stick butter and spices and 1/2 cup water. I cooked this overnight (about 8 hours) on low, then changed the crockpot to the “warm” setting from morning until time to serve. Next I went about making the side dishes. With only two saucepans, I had to cook, clean, and cook and clean again. 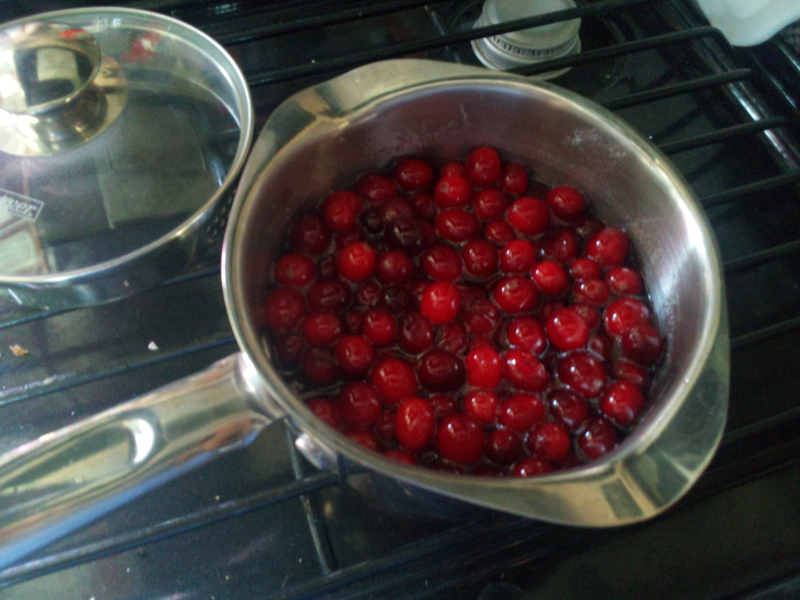 I first made the cranberry sauce from fresh cranberries (the only way to have it!) Easy to make for two in a small pan with 1/2 bag fresh cranberries and 1 cup sugar boiled with 1/2 cup water until the berries open and the sauce thickens just a bit. I then put the sauce in a bowl in the refrigerator to cool and thicken, washed the pan and started on the gravy. At first I tried the gravy that came with the turkey but my son and I both agreed that the gravy just did not meet up to our standards. I then tasted the au jus and it was perfect as-is so we decided on using it. The last two dishes to be made were the stuffing and mashed potatoes just before ready to serve. 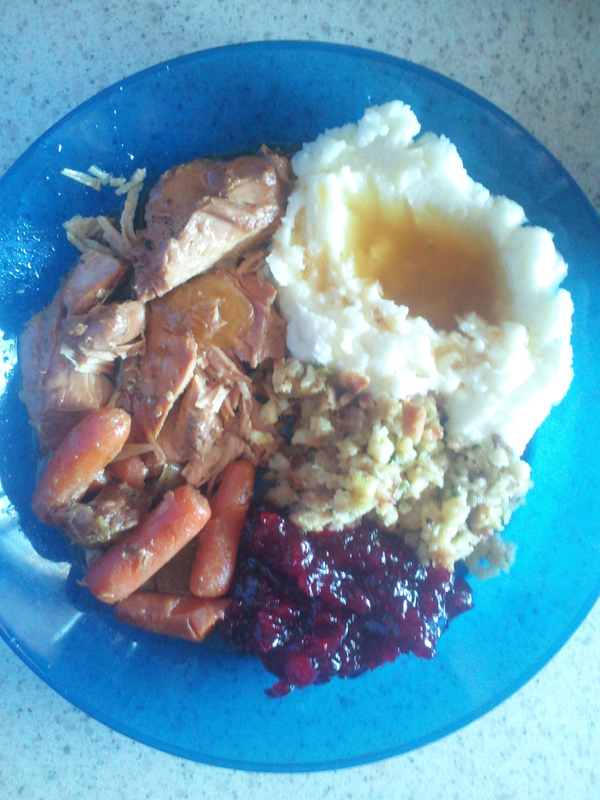 And although in a tiny space, we had a delicious homestyle Thanksgiving dinner made just for two! This entry was posted in 2012, Travel and Tourism, Uncategorized and tagged butterball turkey, clove of garlic, crockpot, delicious homestyle, dinner, rv cooking. Karma didn’t smile on me yesterday!